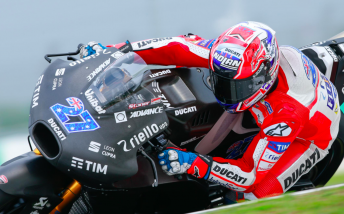 Casey Stoner once again showed his class as he topped the times on the opening day of the MotoGP pre-season three-day test at Sepang. The two-time MotoGP world champion continued his testing duties for the factory Ducati squad after conducting a private test for the marque at the venue last week. Aboard the new GP17, Stoner clocked a session best 1:59.68s early in the afternoon which proved to be 0.11s faster than Ducati’s race rider Andrea Dovizioso. The pair outclassed Ducati’s new signing Jorge Lorenzo, who was left to settle for 17th, a full 1.6s slower than Stoner. New Yamaha recruit Maverick Vinales emerged as Ducati’s nearest rival in third just 0.4s adrift of the outright pace. Aspar Ducati’s Alvaro Bautista was fourth using a 2016 specification bike, while Andrea Iannone was fifth as he continues his transition from Ducati to Suzuki. Britain’s Cal Crutchlow emerged as the top Honda rider in sixth ahead of Moto2 graduate Jonas Folger on the Tech3 Yamaha. Valentino Rossi was eighth ahead of world champion Marc Marquez (Honda) and Hector Barbera (Avintia Ducati). Factory Honda rider Dani Pedrosa could only manage the 13th fastest time as Australian Jack Miller ended the day in 22nd on the Marc VDS Honda. Pol Espargaro was the quickest on the new KTM MotoGP machines in 16th spot. Testing continues tomorrow with Ducati test rider Michele Pirro set to take over from Stoner.